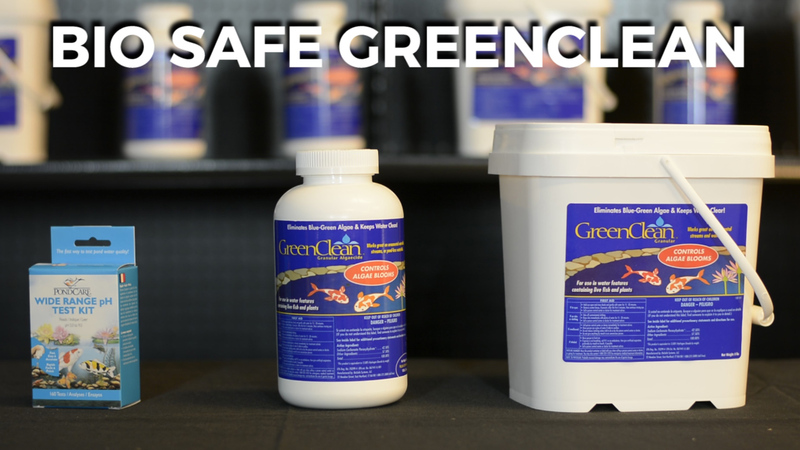 BIOSAFE GREENCLEAN GRANULAR ALGAECIDE REVIEW GreenClean Granular Algaecide is dry-concentrated formula designed to breakdown the accumulated debris and algae from streams and waterfalls. GreenClean Granular Algaecide is dry-concentrated formula designed to breakdown the accumulated debris and algae from streams and waterfalls. Utilizing an activated peroxygen chemistry, a powerful oxidation reaction occurs breaking down algae cells on contact. That you can actually see happening. First, check your pH levels. Levels should be between 6.8 – 7.8. Turn off circulation and apply early in the morning. A calm sunny day when water temps are warm is ideal. Simply apply by covering all affected areas. After about 20 mins., go ahead and turn circulation back on. As the water cascades down, the dead algae will release and fall down the stream. It’s important to note. As the dead begins to fall into the pond, take a net, catch it, and remove. Any organics, especially dead algae, is a food source for algae. Safe for fish and plants, it’s formulated without the use of harsh chemicals or chlorine so rest assured, there won’t be any negative effects to the ponds ecosystem. Available is 7 different sizes, from ½ lb to 50 lbs. For additional questions on GreenClean Algaecide please don’t hesitate to call. I’m Joe from webbsonline, talk to then.